and I think it's useless to argue on those statistics. have a look at primetel's facebook. people are shouting as their connection is almost like a dialup. Even a friend who works for them in Limassol told me to avoid them. και τα μυαλά στα κάγκελα παιδιά. i have been using cablenet for the last 5 months.. and it cannot get any worse.. i have a problem with internet at least twice or 3 times a week. i used to have Cytanet for 6 years and never had a problem, and eventhaugh it was 512, and now i hav 10mbs, the 512 of cytanet used to be better than the 10mbs of cablenet. i didnt have internet in the morning, even after trying to connect with 3 different laptops, so i called for technical support, they put me on hold for 35 minutes, and then i got fed up and closed the phone. save urself and dont use cablenet. maybe i am just unlucky with them.. but still. 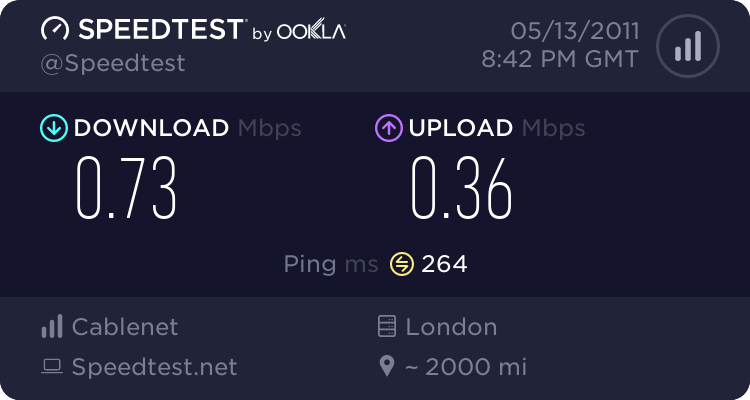 i am going to say that it is the worst internet connection i've had. I have been using cablenet services for almost 3 years now and i am very pleased with the service. I have recently upgareded my subscription to the "Cable nitro package" due to the upload that it includes. Though i have been given the Hitron BVW-3653 modem router which i havent been able to configure to forward any ports to my network (i.e. port 80 or 81 etc for simple http server). I've talked with cablenet and after changing the modem (in case that it has a modem problem) i am still not able to forward any ports. This is a big problem for me since nothing is visible from the internet inside my network. PLEASE IF ANYONE can help contact me. 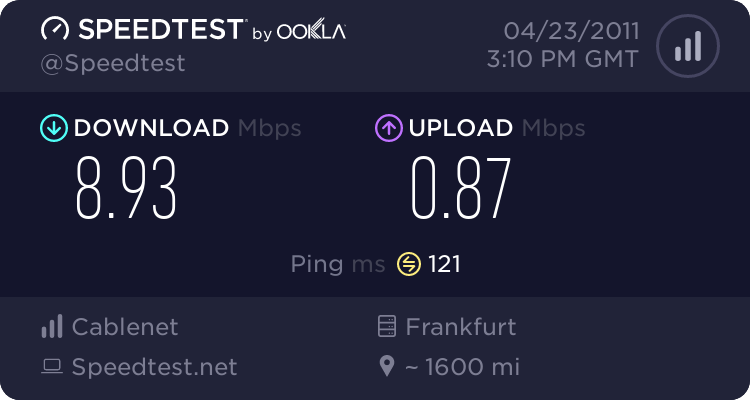 Can somebody run speedtest.net or pingtest.net and check latency in Frankfurt(Germany) I realy want to see the result especialy ping. Except pricing and speeds that was another reason I left Cyta. Disconnections for more than 2 months every night for 1-2 hours. 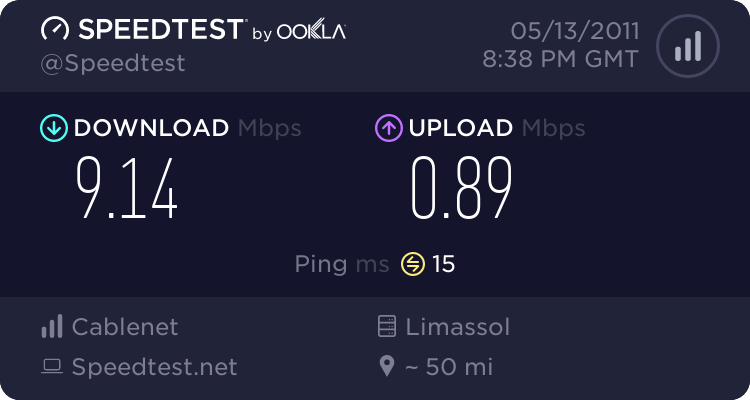 I decided to connect to cablenet in my new apartment and disconnect cyta from my previous house. while waiting for cablenet I decided not to accept cytanet's upgrade from 2 to 4 mbit but downgrading to 1mbit instead. now the idiots charge me for two different netrunner connections. 1mbit and 4mbit for two months and I have to call them every month to clarify that I have never had a 4mbit and never asked for it. Cyta Νιώσε κοντά φτάσε ΑΚΟΜΑ πιο μακριά. The internet speed is not constant. Sometimes it is good, a lot of times it is not. The ping speeds are poor. The wireless on the modem is horrid. I have to constantly reboot the modem because for some reason the wireless functions very slowly periodically (regardless if I have full signal and am sitting next to it). Finally the digital tv I am paying extra for that requires a set-top box which I was instructed to switch off when not in use so it doesn't catch on fire (show's how great their equipment is) does not work. All my channels give 'Access Denied'. yesterday when you made your speedtest to London, there was a problem with most ISPs in Cyprus for 12 hours and speeds were too slow. I was getting the same results as you at that time. it was probably because of thunders. I called cablenet and they told me it's a general problem and it will be fixed soon. I called cyta and when I chose DSLAccess menu it was hanging up the line. I asked some friends which are on cytanet and they told me they had problems too. I went from cytanet to cablenet last week, i've been with cytanet from the first day they brought dsl and besides some problems in the beginning of the service they perfected it the last 5 years. 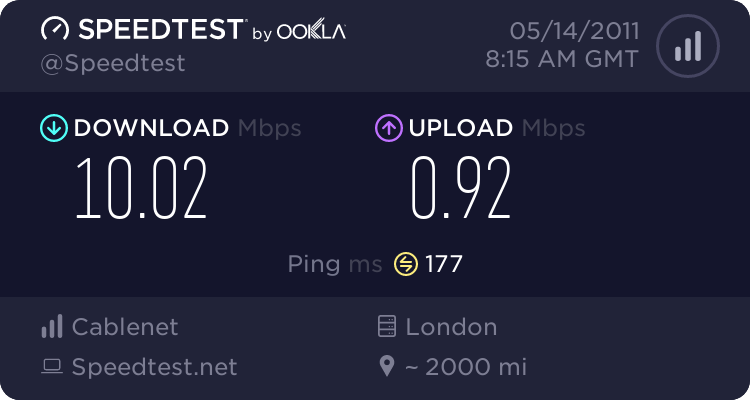 On the other hand with cablenet, i have problems every other day, the internet will either not connect, keep disconnecting, the speed will be very slow, browsing will be glitchy, and gaming will have pings of 300-900ms. Yesterday as someone said it was completely screwed the whole day. Today im limited at 120kb/s. I just hope they fix their service soon. Which are the test results you get from this speed test? Its fine, but its midnight. It was a tenth of that speed this afternoon. Any one experiencing disconnections with cablenet?This happens only at night 8-4am,My modem levels are not stable and the signal noise ratio of the line is going like hell,I was calling them for 1 week until they understand the problem was from outside.This week their idiot technicians were coming every day here in the street trying to find the problem, and finally the connection got worse.I very angry with them. Customer support 0/10 i really mean that. Another question for those who owned a hitron BVW-3653,is it working with docsis 3 frequencies or is it still using docsis 2 because it's a 1.0-3.0 compatible modem.Can you get into modems administrative page? Yes, I`m getting constant disconnects at this moment. Calling technicians won't fix the incompetence of the company, you`ll just have to wait until they get their act together, which might take months or years. My recommendation to everyone is to stick with cytanet.